SALT LAKE CITY - Truck drivers who are frequently fatigued after work, use cell phones while driving, or have an elevated pulse pressure – a potential predictor of cardiovascular disease - may be at increased risk for getting into truck accidents, according to a study by the Rocky Mountain Center for Occupational and Environmental Health (RMCOEH) at the University of Utah School of Medicine and published in the Journal of Occupational and Environmental Medicine (JOEM). Long-haul truck driving is one of the deadliest professions, according to the Bureau of Labor Statistics. Truck drivers are involved in an estimated 250,000 crashes each year, with 1 to 2 percent resulting in fatalities. This study sought to identify health and occupational factors that may contribute to crash risk. The researchers surveyed 797 truckers at truck shows and truck stops in six states (Illinois, Iowa, Kentucky, Nevada, Texas, and Utah). 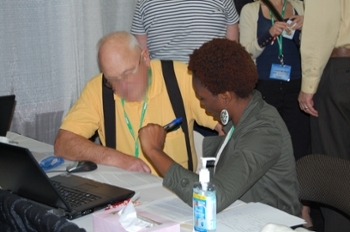 Participants underwent a basic physical exam and completed a self-reported questionnaire tracking crash history, indicators of health and mental status, working conditions, and lifestyle choices. After adjusting for multiples variables, statistical analyses identified factors that were significantly linked to crash histories. Future studies will need to experimentally prove that the identified factors cause an increased crash risk. Two indicators of poor health management – high pulse pressure and fatigue – were highly associated with crash risk. High pulse pressure, a blood pressure measurement, may signal heart problems. Thiese adds that any number of characteristics common to the profession - including stress, long hours, heavy lifting, and lack of sleep and exercise - could contribute to these conditions. As has been observed among the general population, cell phone use while driving was also highly associated with crash risk. This research also revealed signs that truck driver health is not well managed. Nearly 24 percent of truck drivers in whom they had detected high blood pressure had not previously been diagnosed, and their condition was not being treated medically. Similar to previous studies, they also found that 62 percent of participants were obese, much higher than the 35 percent reported for the general adult population by the Centers for Disease Control and Prevention. “The high incidence of uncontrolled hypertension was a surprise, particularly given that truckers must undergo medical certification every two years,“ says Thiese. “It’s another indication that truck drivers’ health needs are not adequately being met and could be endangering them in ways that we may not anticipate.” Thiese, Hegmann, and colleagues are now developing ways to enable truck drivers to better control their health. Thiese, Hegmann, and co-authors Ulrike Ott, Riann Robbins, Atim Effiong, Maureen Murtaugh, Deborah Passey, and Eric Wood are from the Rocky Mountain Center for Occupational and Environmental Health at the University of Utah School of Medicine; Melissa Lemke, Jay Kepellusch, Arum Garg ,and Gwen Deckow-Schaefer are from the University of Wisconsin-Milwaukee, and Natalie Hartenbaum is from Occumedix, Inc.
“Factors Associated With Truck Crashes in Large Cross Section of Commercial Motor Vehicle Drivers”, was published in the Journal of Occupational and Environmental Medicine.